Traditionally and legally, remorse is an acknowledgement or guilt for crimes committed against unarmed groups of people by perpetrator(s) or is a reflection towards the journey for peace. This is what survivors (victims) of massacres in Northern Uganda are asking their government to do; apologize to them for its failure to offer unarmed civilians, as stipulated by the constitution, protection during the two decades of brutal war. In Corner pa Aculu village in Opota trading center in Omot Sub-County in Agago district, 28 people were slained and their bodies mutilated before being cooked in pots by ‘suspected’ LRA rebels. The gruesome murders allegedly came as a revenge attack by rebels against the escape of one of their soldiers. Since that fateful day, the village has remained in a state of darkness, as people constantly linger around the memorial built in remembrance of their relatives and continues to yarn for justice. This memorial according to survivors does not represent, anything, more that a home of troubled ghosts. Ms Agnes Amito is a widow left to fend for her five children born to late husband Alex Labeja whose name is inscripted on the memorial. She is bitter, “this memorial is here for me to observe my husband names than make me a partner with it,’ she says. Amito is willing to see justice beyond memorial, and accuses the government of the omission of these crimes. “My heart aches painfully as I cry but nobody is willing to wipe my face,” she teary says while shaking her head. Late Labeja was a breadwinner to Amito’s family and without him, she lives in despair. Amito recalls the day the massacre occurred. She says that men wielding AK47 riffles and clad in green military uniform, surprised them when they stormed inside the house and ordered everybody to lie down on their stomachs, before taking her husband five minutes later. She remembers that Opota Trading Centre was once an active center where locals met and mingled, but it has now turned out to be a scene of horror, death and brutality where the lives of 28 individuals and others were cut short in their prime. “The memories are sad, it makes one terrified and helpless,” says Amito . To Amoito, ten years of grief and tears seems feels like an hour gone, she yawns for justice but says that no one is willing to show her the way. Clad in her dark blouse and stripped dress, Amito believes that the memorial monument was rushed in order to silence them from telling the truth. “His promise is empty to me,” says Amito referring to president Yoweri Museveni 2003 election campaign pledge in Patongo to support survivors and their children. In Acholi culture, the brutal killing of a person is unacceptable and is compensated with 14 herds of cattle. Only two bulls are needed by Amito to enable her raise her children who have been booted out of Wang-lobo Primary School. Amito’s story is shared by Ms Hellen Akello, a survivor of the Mucwini massacre of July 24th 2002 in Kitgum district. The brutal killing of 56 people followed an alleged escape of a rebel back home with a gun. Akello says that much as there is a need for people to accept their mistakes, sometimes it is just too hard to forgive. Local officials say that the massacres were not adequately exposed and leaders educated on the need to apply redress. 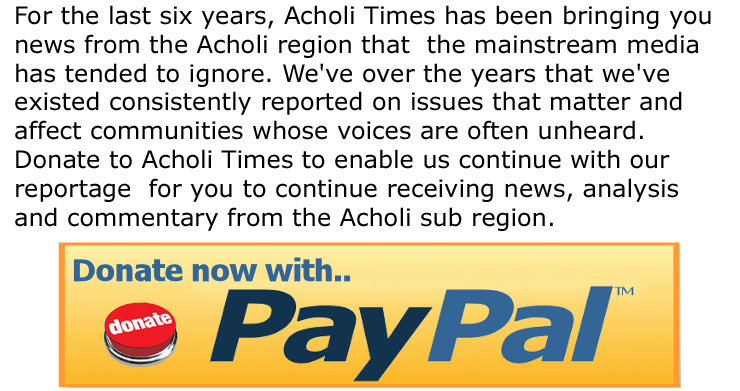 Acholi fears trace from Apiri village in Pader district where mass death was caused by small pox. Oweka says it is vital for Uganda military commanders responsible for the protection of civilians in Omot to be held accountable. He says Agago local government has tried to counsel the survivors to remain tolerant. At the time, the responsibility to protect the people in Omot was under the command of 4th Division commanding officer Col. John Mugume. Mugume was quoted during his handover in December 2003 saying he partially did his best to fight off the LRA rebels. President Yoweri Museveni promised to support the survivors of the massacres in 2003 during election campaigns but he has failed to fulfill his promise causing anxiety instead. “The President has the knowledge of the massacre, but he is reluctant to accept government misdeeds and that it was wrong,” says Oweka. On the other hand, Agago woman legislator Franca Akello Judith says many times she called on state house to follow up with the pledges to the survivors, her pleas have fallen on deaf ears. “Our horrible memories continue to grow every day, interests and needs are not being met,” Franca says. Franca wonders how survivors could forgive without knowing who to forgive and what to forgive them for. Franca believes both parties to the conflict need to be held accountable and any redress must involve reparative process suitable for a particular situation. Uganda government is a state party to International Human Rights instruments obliged to protect, promote and fulfill its obligation to the citizenry. Some victims believe that the unspeakable truth will remain unheard and difficult to unearth because of risk to personal safety. The UN OHCRHR right to truth resolution 2005/66 stipulates acknowledging in case of gross human rights violation and serious violation to International Humanitarian Law. It also spells out the need to study interrelationship between the rights to truth and rights to access to justice, the rights to obtain effective remedy and reparation and other relevant human rights. 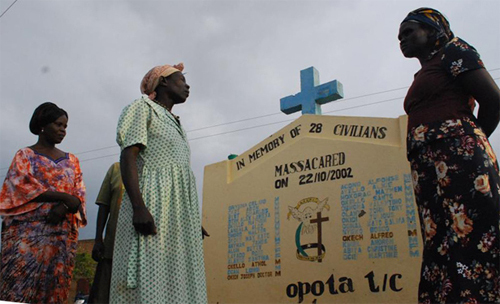 It is ten years now since the victims of the Omot Massacre have been waiting for the fulfillment of these rights by the government. The Program coordinator of Justice and Reconciliation Project (JRP) Mr Boniface Ojok says each community in the north who suffered has so many stories to tell from mass graves, mass burials and forced disappearance of people. Ojok says it’s important to dig deep into such heinous occurrences and find out how survivors were coping with situations and how their resilience were being embraced by government and civil societies. “There is no any concrete acknowledgement by government on the massacres,” says Ojok “recognizing its misdeeds, much blame is thrown on LRA rebels and this is further rubbing salt on the wounds of victims,” says Ojok. Some of the government driven memorials are Barlonyo in Lira, Omot, Atyak, Palabek, Mucwini and Lukodi. “The support given to the victims are authoritarian and that is why authority moved quick to give blankets and food knowing what lies behind is much bigger needs,” Ojok says. Mr Ojok says the primary principle of what victims need to know is the truth as the whole embodiment of reparation. He says that in Mucwini for instance, victims want to build their own monument – reflecting a cry for truth. He says any buildings in memory of massacres (school) should be a sign of giving back and remorse and a testimony for never again but overall it should link itself to actual incidents, rather than routine school buildings. “What I know is that gov’t has acted fast to silence publicity of ruthless killings in northern Uganda,” Ojok notes. Ojok says much as there are memorials and scheduled commemoration Days for victims, they only serve to haunt the victims and their loved ones. He calls on the government to come up with a truth commission, reparation policy or law for confronting the past, so that lives can move on. He notes that while the debates continue as to how these dilemmas are resolved, there are brewing conflicts between perpetrators and victims due to resource sharing and land disputes, all long term war grievances. Only a small proportion of these conflicts are being settled by traditional mechanism of Mato Oput (drinking the bitter roots of Oput tree) as spelled out in the Agenda number 4 of the Juba peace Agreement. But Ojok in ‘burn out’ with thrilling effect of trauma of working with the victims urges for an extensive mapping of victims to curtain the challenges in addressing their needs. To him, the path to the goal of peace is a long way since parties are less bothered to acknowledge responsibilities. Remorse or confession is clear acknowledgement of bitter pain of any crime but a reflection to the journey of peace to which the survivors are yawning for the government to stand tall for the heinous crimes they may have committed in northern Uganda than make a blame game.